Update 6th Feb 2018: The data for the missing months is now available and has been incorporated into the linked Google Fusion sheet. The law says that local government should publish a list of payments to suppliers over £500 (and recommends publishing payments over £250). I remember looking at Sheffield’s data some time ago and giving up because the quality was so poor. Well, this time I’ve persevered and I’ve published a much more usable data set. 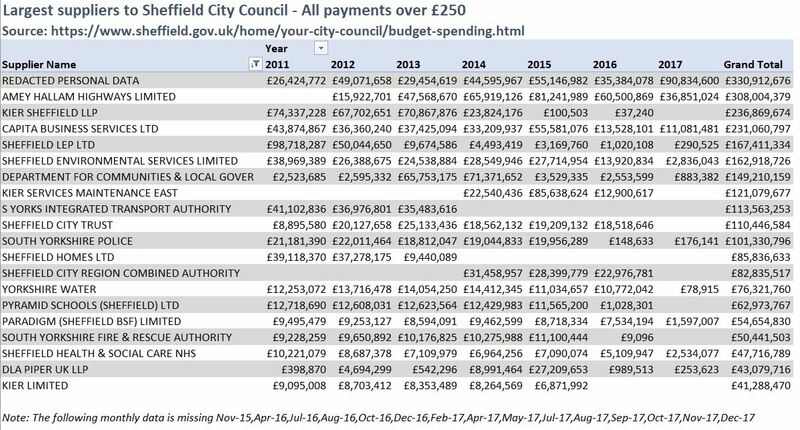 An example of how this data could be useful, it’s possible to check to see how much money Sheffield Council has paid to Carillion, what is was for, and verify their statement that all the council contracts with Carillion are complete. Much of the data is missing, and much of it is inconsistently formatted (notably dates, which are in any format from Excel integers, to mm/dd/yy hh:mm:ss to d/m/yy), this makes it REALLY difficult to use the data without investing a significant amount of time. At the moment, the data for the following months is missing Nov-15, Apr-16, Jul-16, Aug-16, Oct-16, Dec-16, Feb-17, Apr-17, May-17, Jul-17, Aug-17, Sep-17, Oct-17, Nov-17, Dec-17. I’ve gone through the data, cleaned it up, and combined all the monthly files into one. The scripts I used are in this GIT repository. The final data is published in this Google Fusion Sheet and can be downloaded as a spreadsheet easily. This entry was posted in Uncategorized on January 23, 2018 by Matt.